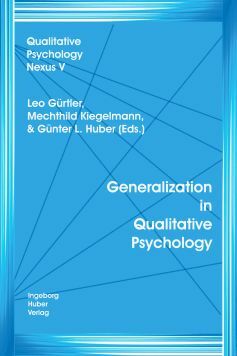 "Generalization in Qualitative Psychology" took place in Klagenfurt (Austria), October 21-23, 2005. It was organized by Philipp Mayring, Institute for Psychology and Center for Evaluation and Research Consulting, University of Klagenfurt/Austria and the Center of Qualitative Psychology, University of Tübingen. - examples of generalizing empirical findings. Should we generalize? Anyway, we do it all the time in everyday life. Integrated methodology: From self-observation to debate groups to the design of intercultural educational materials and teacher training.